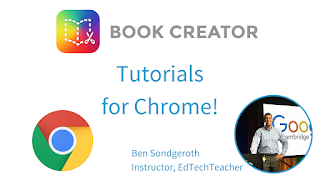 In part one of the Book Creator video series we explore how you can use the new Book Creator for Chrome with your students. It is an amazing tool that can facilitate many forms of learning! Using Libraries and Collaboration in Book Creator! This is part 2 of Ben's video series on how to use Book Creator for Chrome! In this video, Ben looks at how teachers can leverage the libraries option in Book Creator to manage their student's work. He also looks at how real time collaboration is now possible with Book Creator for Chrome!